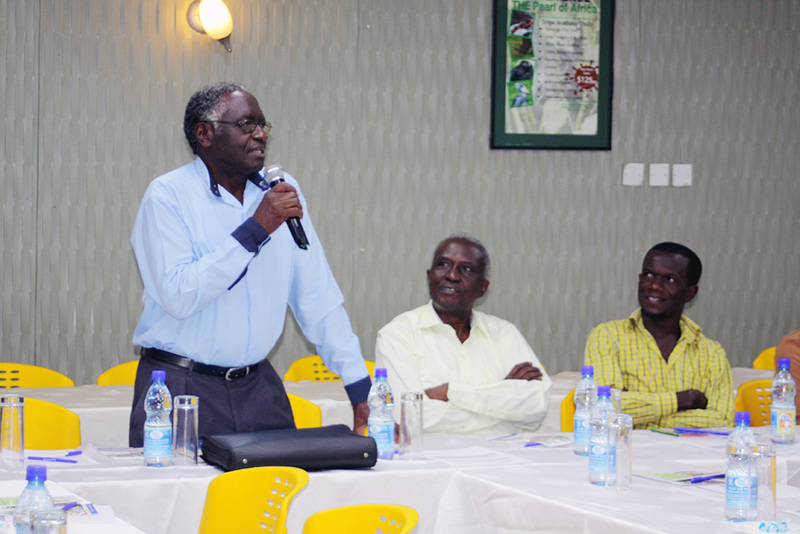 This dialogue, supported by SPRING, was the first time that millers and the public sector met to discuss the way forward in scaling up fortification of maize flour. SPRING also presented on the national standards for mandatory food fortification, tax implications on imported premix (the blend of vitamins and minerals), and described potential technology options for millers. After this meeting, SPRING’s hope is that millers will continue regular dialogues with the government. “This dialogue has been very beneficial in a way that it has enlightened us on the commitment of the government. By coming up with the programme of subsiding taxes in terms of VAT and import duty tax, [the government] encourages more millers to fortify maize flour,” said Susan Oketch, Assistant Commissioner, Education Standards, and Nutrition Focal Person in the Ministry of Education and Sports. 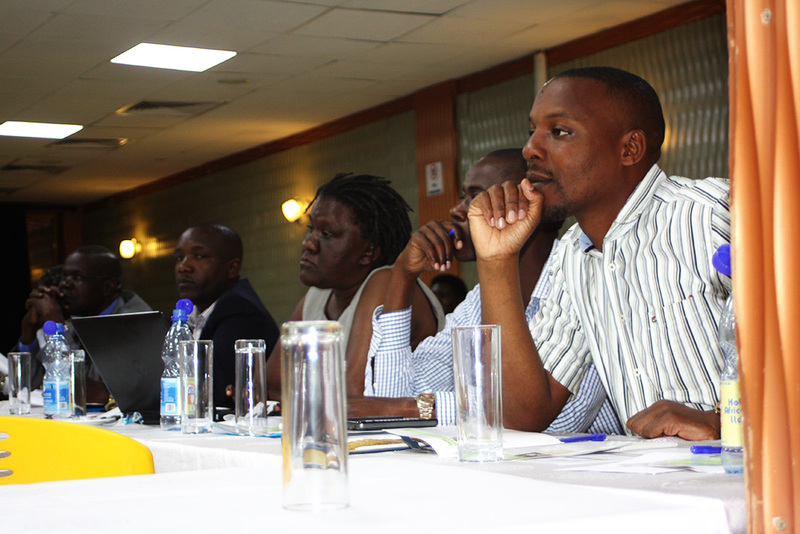 Many millers attending the stakeholder’s dialogue said they have not pursued fortification due to the cost of fortification technology, calibration, and premix. Millers have to purchase premix from one of five approved suppliers, and only one has a local supplier. 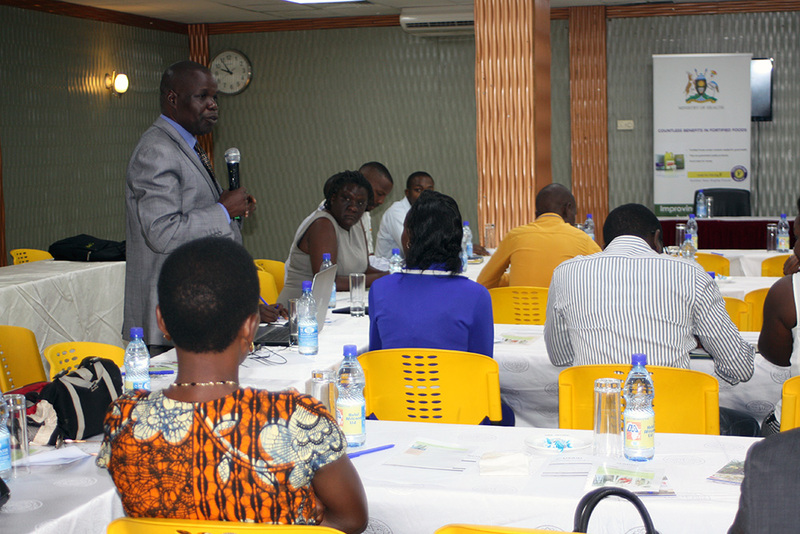 A representative from the Uganda Revenue Authority informed millers that, in recognition of the benefits of food fortification, millers’ taxes on imported premix have been reduced, and the import duty (normally 25 percent) has been eliminated. “Calibration is expensive because it is done by consultants. The start-up cost is the highest – you must buy the dossifer and go through the tests to certify you are ready to fortify. It is quite an expensive process. I need the assurance at the end of the day that I will spend this much and that at the end of the day I will earn this amount,” said Edward Tumwesigye, Production Manager at Apoyne Millers. During a national survey, SPRING found 27 maize millers have sufficient production capacity to fall under mandatory fortification standards in Uganda, however, just four of these millers currently fortify. Furthermore, most fortified maize flour is produced for humanitarian agencies and exported to Rwanda, Congo, and South Sudan. In 2016, Ugandan millers produced 16,500 metric tons of fortified maize flour but just 11 percent of this fortified flour went to local markets. Millers said that lack of consumer demand means they are not interested in fortifying. Some people do not understand the meaning or benefits of added vitamins and minerals to fortified flour. 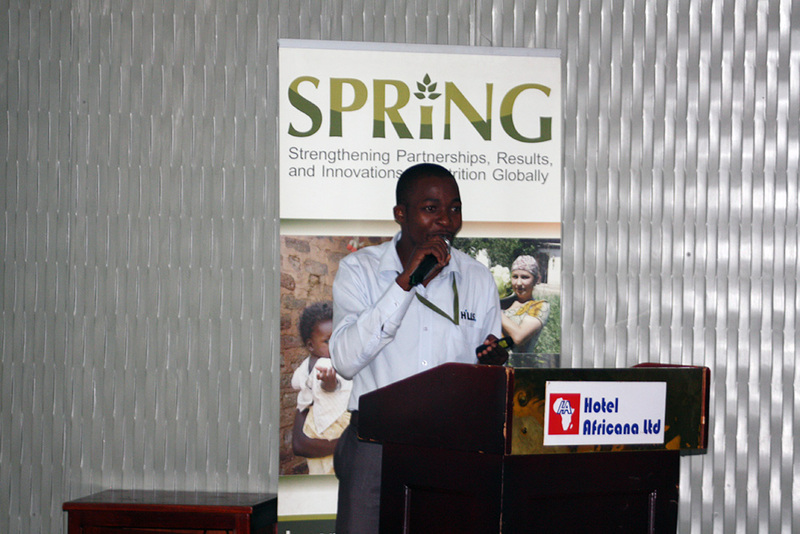 As a result, SPRING found that fortified flours are currently sold at the same or lower price than unfortified maize flour in local supermarkets. “Our clients are not aware of the advantages of eating fortified foods, and the driving factor [for fortification] is the market. We need to increase awareness so consumers know the advantages of consuming fortified foods. You will not tell me to invest in the equipment unless I get the trigger from the market.” said Sossim Twesigye, a miller from Farm Uganda. This dialogue was the first step along the path to increasing access to fortified maize flour in Uganda. “All sectors including Ministry of Education and Ministry of Health need more dialogue with the industries to share information on the issues affecting millers, from fortification of maize flour, to the benefits of food fortification, and [the population’s] ability to afford fortified maize flour,” said Ms. Oketch. 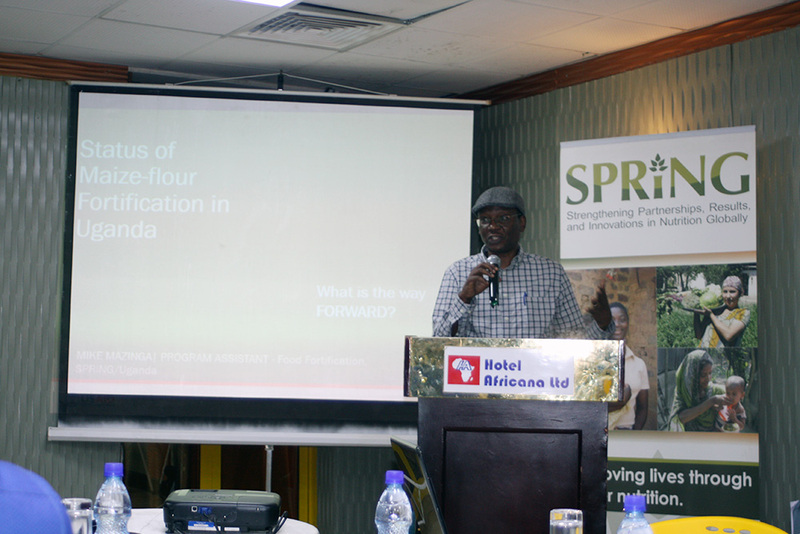 Over the past five years, SPRING/Uganda has strengthened the capacity of the national food fortification program, including coordinating national fortification activities, supporting regulation and enforcement, and facilitating demand creation for fortified foods. Promoting the fortification of maize flour is SPRING/Uganda’s latest effort to reduce micronutrient deficiency among women and children. 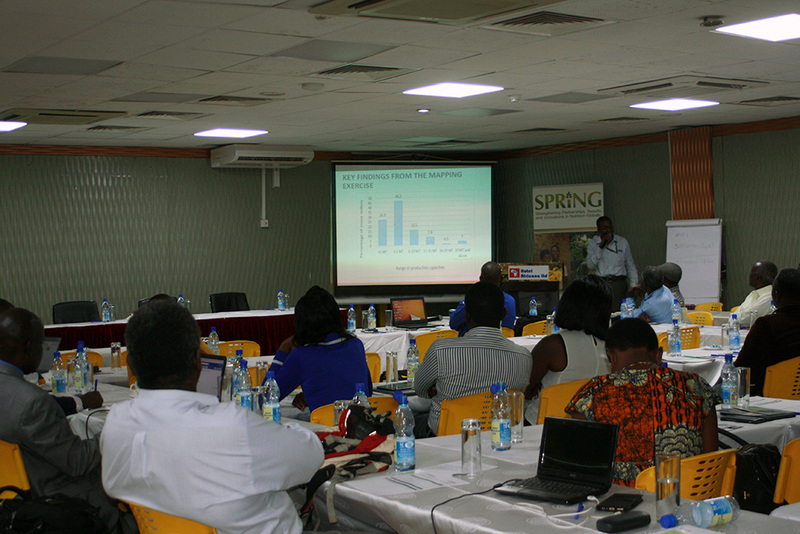 Photo: SPRING staff member Mike Mazinga presents on the current status of maize milling in Uganda.